In an ideal universe, we would all have cable-grade Internet connections with 0.5 ms latency and unlimited downloads from NetFlix, and a wealth of ISPs to choose from, even if we’re living in remote areas of the planet. Meanwhile, back in RealityWorld, some of us are actually constrained by the resources of the one available ISP in our locale. So to you web developers living in Chicago, Philly, NYC and other bastions of First World Internet-Land: Yo! We don’t all have unlimited bandwidth, we’ll tell you when we want to download something! My situation is pretty extreme, but not all that unique. I have no cable, no DSL, no reliable wireless. My only option is a satellite ISP. Bear in mind, I’m not really that remote. The nearest Comcast cable connection is 15 miles South in Falcon, Colorado, and I’m only 45 minutes away from Colorado Springs, so I’m hardly out in the wilderness, but satellite is all I can get. I share this restriction with a couple million other folks, according to this article. My ISP is Wildblue (owned by ViaSat). Wildblue’s Data Allowance Policy (DAP) is pretty limited, so I know better than to try to view movies or large videos. As a result, I’m not real familiar with such services, and that’s one of the reasons I got bit. Prior to HTML5, in order to view a video you had to install some kind of browser plugin – I’m looking at you Adobe Flash. With HTML5 , video playback is embedded and available using the video tag. Recently a local video producer sent us some samples of his work via a link to Vimeo. We went over to take a look, and we viewed something like 6 videos over a span of about 30 minutes. Then we walked away and left the Vimeo browser tab active. About 9 Giga-Bytes of video data got auto-downloaded while we weren’t looking, and Wildblue shut down our service. Lovely. We’ve been DAP’ed! 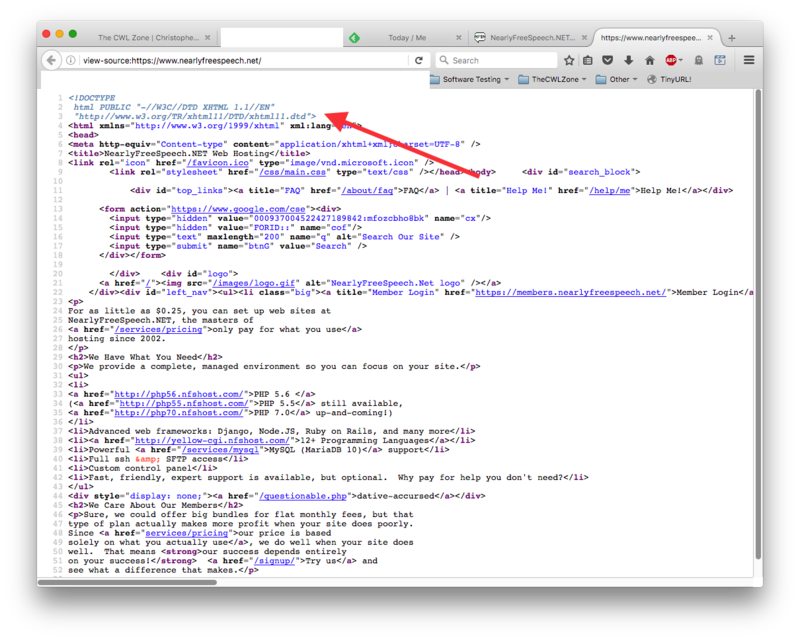 So, is a web site running HTML5 or not? 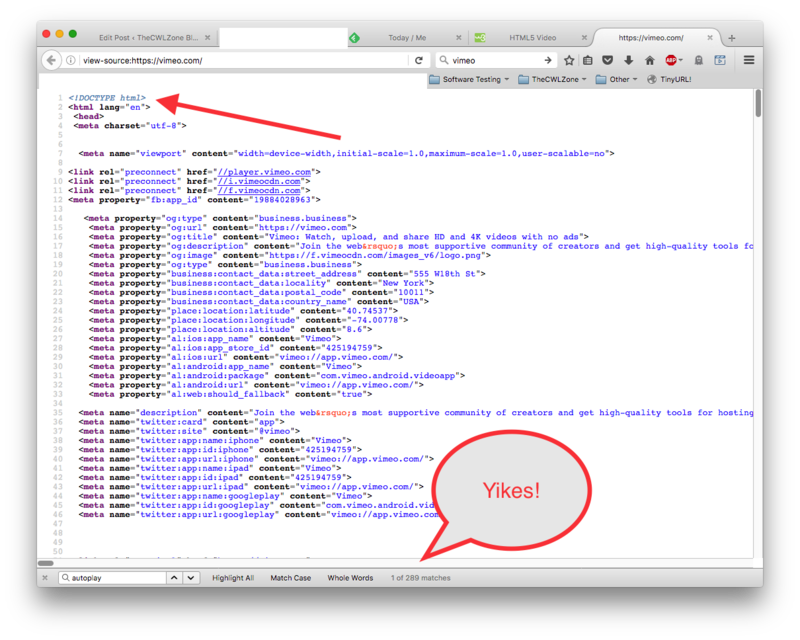 It’s easy to check – mouse-right-click on View Page Source, and the first line on the page will tell you. You are looking for the DOCTYPE declaration. it’s HTML 4, and the video tag will not be available. Vimeo uses HTML5 and 289 autoplays on its home page! This PC World article has a nice overview of various browser fixes for HTML5 autoplay, including some config changes to Firefox. Chrome apparently requires an extension. 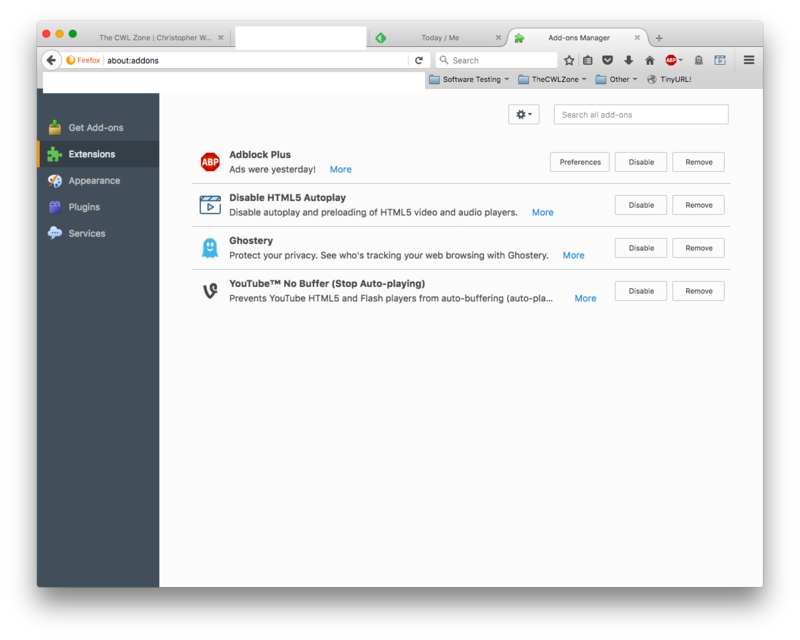 The Disable HTML5 Autoplay extension can be used for all browsers if you want to play with the source, but it’s mainly designed for Chromium-based servers (i.e. Chrome). Note: I am not currently using Chrome, I’ll talk about that in another post. In searching articles about HTML5 video, I get the feeling that audio and video can still get downloaded despite the config changes and browser extensions under some circumstances. I wish I could quantify that feeling. In any event, I’m thinking that I will need to up my bandwidth usage monitoring strategies, which will be another topic for later. Cheers!